Does the pesticide glyphosate cause cancer or not? The latest in the controversy surrounding glyphosate (in Roundup), which is the most commonly used herbicide (weed-killer) in the world, is a journal article written by Dr. Charles Benbrook. He looked at why 2 government agencies came out with conflicting views regarding glyphosate - the EPA said glyphosate is “not likely to be carcinogenic to humans”, while the International Agency for Research on Cancer (IARC) considers glyphosate as “probably carcinogenic to humans". Benbrook points out a number of problems with the EPA designation. Uh oh. It appears that the studies the EPA looked at were not as up to date (they ignored at least 27 recent studies), they relied heavily on the manufacturer's own studies (bias!!! 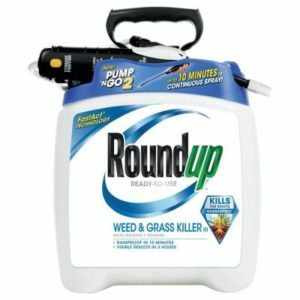 after all, the manufacturer wants to sell the pesticide) rather than studies done by independent researchers, and the EPA ignored work that shows that the product Roundup (with its extra ingredients) is more toxic than glyphosate alone. But guess what - in the real world people are exposed to Roundup, not just to pure glyphosate. Increasing numbers of studies are finding health effects (cancer, kidney problems, endocrine disruption, etc) from exposure to glyphosate, and it turns out we're exposed to it daily in the foods we eat (here, here). And yes, studies show that most of us have glyphosate residues in us (it can be measured in our urine). What is it doing to us to constantly eat foods with low doses of glyphosate residues? What about pregnant women and their unborn babies? The paper was authored by Charles Benbrook, a former research professor who served at one time as executive director of the National Academy of Sciences board on agriculture, and was published in the journal Environmental Sciences Europe on Monday. It is based on Benbrook's review of EPA and IARC records regarding the types and numbers of glyphosate studies each organization evaluated. "Clearly, compared to EPA's genotoxicity review, the IARC review is grounded on more recent, more sensitive, and more sophisticated genotoxic studies, and more accurately reflects real-world exposures," Benbrook told EHN. Benbrook looked at the citations for genotoxicity tests discussed in the EPA and IARC reports, both those that were published in peer-reviewed journals and the unpublished ones that were presented to the EPA by Monsanto and other companies. Some studies looked at glyphosate alone, and/or glyphosate-based herbicide formulations and some included findings about a substance called aminomethylphosphonic acid (AMPA), which is glyphosate's primary metabolite. Benbrook's analysis found that within the body of available evidence, the EPA relied on 151 studies, 115 of which showed negative results, meaning no evidence of genotoxicity, and only 36 that had positive results. IARC cited 191 studies, only 45 of which showed negative results and 146 of which showed evidence of genotoxicity. IARC said within these studies it found "strong evidence that exposure to glyphosate or glyphosate-based formulations is genotoxic…"
According to Benbrook, the EPA's failure to focus on formulated glyphosate-based herbicides is dangerous because these formulations "account for all commercial uses and human exposures (no herbicide products contain just glyphosate)." More research is needed on real-world exposures, Benbrook concludes. Previous article:Periodontal Disease Link to Alzheimer’s Disease?